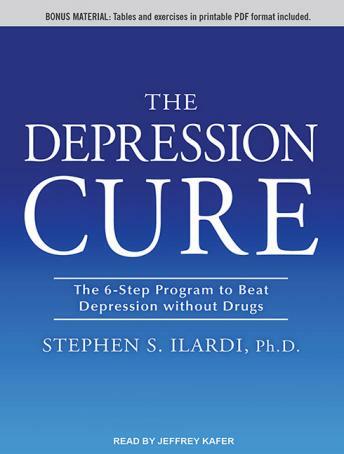 Listen to "The Depression Cure: The 6-Step Program to Beat Depression without Drugs" on your iOS and Android device. In the past decade, depression rates have skyrocketed, and one in four Americans will suffer from major depression at some point in their lives. Where have we gone wrong? Dr. Stephen S. Ilardi sheds light on our current predicament and reminds us that our bodies were never designed for the sleep-deprived, poorly nourished, frenzied pace of twenty-first-century life.Inspired by the extraordinary resilience of aboriginal groups like the Kaluli of Papua New Guinea, Dr. Ilardi prescribes an easy-to-follow, clinically proven program that harks back to what our bodies were originally made for and what they continue to need. The Depression Cure program has already delivered dramatic results, helping even those who have failed to respond to traditional medications.